Noise elimination is one of the main problems in achieving higher data rates and longer communication cables. There are several ways noise can be reduced. Communication lines can be shielded. Differential communication like with RS422 and RS485 is quite immune to noise, especially when the wires are twisted. Low output impedance and proper termination resistors to reduce reflections may also help, but there will always be some noise left on the line. This noise can be reduced by adding input filters, for example with an RC network, but input filters have the disadvantage that they not only reduce noise, but also the maximum allowed data rate. Another possibility is adding a hysteresis in the input line. An input line with hysteresis uses two switching levels Vhigh and Vlow. When the input voltage exceeds Vhigh, the output switches to a high level. Only when the input voltage falls below Vlow (which should be lower than Vhigh), the output switches back to its low state. This type of noise reduction is implemented in the inputs of the I2C bus. The effect of an hysteresis can be seen in the next picture. 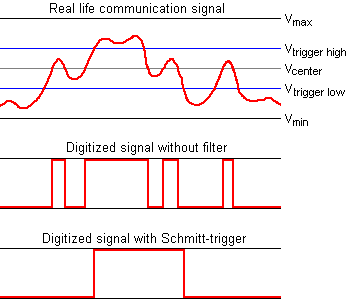 The first graph shows the actual input signal. There is quite some noise on the line, and if the center voltage is used to determine if the input is in the on, or off state, there can be four high periods detected in the signal as shown in the second graph. If we however use two trigger levels with hysteresis, it is possible to reduce the number of detected logical highs to only one. This is what the Schmitt trigger does in the last graph. Making an electronic circuit with hysteresis is not difficult, thanks to Otto Schmitt, an American scientist. He invented a simple electronic circuit which has a built-in hysteresis effect. This circuit is now known as the Schmitt-trigger. Two transistors and a handful of carefully chosen resistors are enough to create the circuit. The values of the resistors define the input voltage levels where the Schmitt trigger circuit changes state. The basic Schmitt trigger circuit is shown in the next picture. The Schmitt trigger circuit uses emitter coupled logic. Therefore VE = VE1 = VE2. 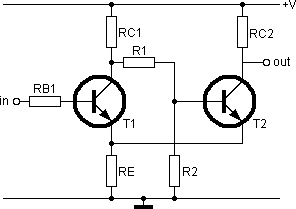 It is evident that an increasing voltage at the input of the circuit will keep the circuit in the high state. This is because a higher voltage at the input will create a higher base and collector current and this higher collector current will pull the base voltage of transistor T2 even further down. But when does the circuit fall back to its zero state again? This requires further analysis of the circuit. If Vin is lowered, the current flowing through T1 will decrease. This causes the current through resistor RC1 to decrease and the voltage level at the base of transistor T2 will increase. Because the transistors are emitter coupled, the emitter voltage of that transistor decrease, and when Vin is low enough, the base voltage of transistor T2 will become slightly higher than the emitter voltage, causing a small base current to flow through T2. This small base current will create an emitter current through the shared resistor RE. The emitter voltage will rise and less current will flow through T1 because the voltage difference between the base and emitter of T1 gets smaller. This causes less current to flow through RC1 and the base voltage at T2 increases even more. T2 will open and T1 will close at the same time. At this input level Vin the circuit has changed state back to zero. But at what specific voltage is this state change triggered? Calculating the low trigger voltage for a Schmitt trigger circuit is a little bit more difficult than calculating the high trigger level. T2 will start to open when the base voltage VB2 gets slightly larger than the emitter voltage VE2. We will try to calculate the input voltage where VB2 and VE2 are equal when T2 is closed. First some basic calculations for voltages and currents in the circuit when T2 is closed. As stated above, we assume that the base currents flowing through the transistors are small. Therefore the collector current and emitter current through T1 are considered equal. Also because T2 is closed, there won't flow any base current through this transistor. With this equation, we can easily calculate the voltage level VB2 of the second transistor.